Seattle Branch midweek hike of the Maple Pass Loop with 8 hikers. Trail was in good condition all the way around. No issues. The side trail to Lake Ann is in also good shape, but can be confusing in places due to other social trails in the area. Keep following the main trail around to the right. The trail ascends for a while before descending again to the lake. We looked for but did not see the wasp nest that is mentioned in some recent WTA reports. We got started about a half hour later than planned due to unexpected midweek construction along rural sections of WA-530 and difficulty finding some members of our party at the trailhead who had come up separately the night before and camped. The trailhead area is very large, so meeting “at the trailhead” was not specific enough. 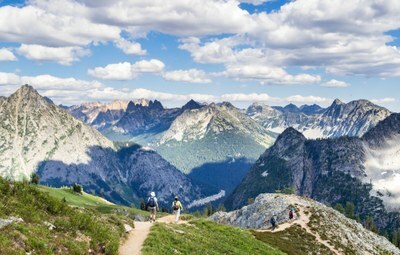 Once united we hiked the Maple Pass trail counterclockwise with side trips to Lake Ann and Heather Pass. We had clear skies, a moderate breeze, and picture perfect puffy clouds all day (see picture). It was a bit warmer than ideal at lower elevations but became comfortably cool once we gained the ridge. We had planned to finish with a side trip to Rainy Lake, but decided to skip it in deference to the long drive time back home, including two members of our party who were driving all the way back to Olympia. This being a midweek daytime (i.e. non-evening) summer hike, the diversity in the group was quite nice. The ages in our group ranged from 19 to 74 and included retirees, students off for summer break, teachers off for summer break, and at least one working stiff (the trip leader) who took a plain old vacation day. The entire day including drive time was very long. We left the P&R at 6:30a and didn’t get back until almost 9pm. To shorten the day without compromising the core parts of the trip, some things that might be done differently include: 1) Skip the side trips to Lake Ann and Rainy Lake. Though both are breathtaking when viewed from a distance, the specific vantage points provided by the trails are “merely good”. This trip is about the views from above. 2) If meeting at the TH be precise about where to meet. There is no cell coverage, so all logistics must be worked out in advance. The side trip along Heather Pass is short and very scenic, so is worth the time.